Rolex forum and message board members are reporting the release of Rolex Magazine in Europe and the U.K. Rolex is well known for their top notch marketing materials, and they have a long history in publishing masterful print publications. Rolex’s marketing and point of sale publications help build the Rolex mystique. Rolex conveys its #1 image utilizing top-notch collateral materials complete with stunning images, well-written stories, and well-bound publications. Rolex has worked with other established publications such as Stiletto fashion magazine for Rolex-centric editions, and with National Geographic for its print version of Perpetual Spirit – Explorer. Venturing outside of the print space, Rolex has even delved into distributing one of the best Rolex marketing iPad apps (with help from National Geographic), and have mirrored much of their material on their YouTube channel and website. And that is one of the reasons why the release of Rolex Magazine is somewhat odd because Rolex has defined the industry standard for collateral materials. Rolex has published Perpetual Spirit Magazine for years typically found at one of the three Rolex Service Centers in the United States, as well as in Rolex Authorized Dealers. Rolex Magazine edition #1 appears to be the first publications with Rolex CEO Gian Riccardo Marini writing the forward. Typically, the Rolex CEO has been historically silent inside the publications. Watch journalists have shared that getting any Rolex CEO to say anything publishable is always extremely difficult. Rolex Magazine edition #1 covers three main forward-looking topics. Unlike the Rolex website which has been focusing upon its past, provenance, and historical figures whom wore Rolex, Rolex Magazine edition #1 covers Daytona (the race) and the platinum and stainless Daytona (the watch), Rolex’s sponsorship of the Formula 1 racing circuit, and a profile of its new production facility in Bienne Switzerland. 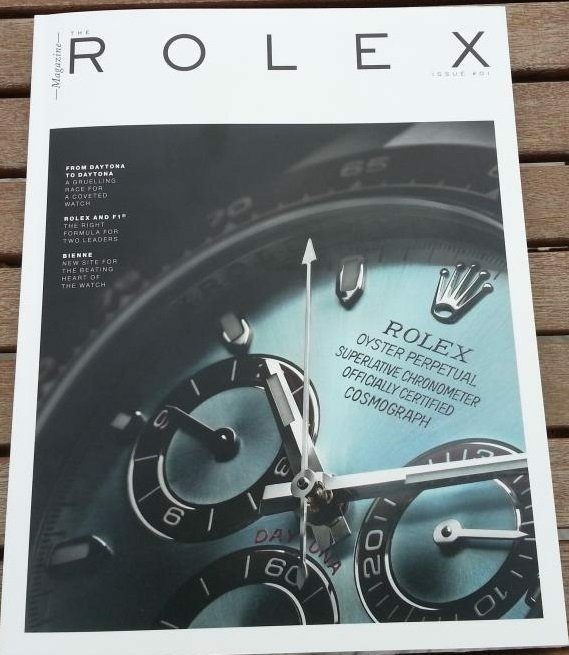 Unlike other typical Rolex publications utilizing their in-house or copy writers, Rolex recruited Wei Koh, editor-in-chief of Revolution horology magazine. Wei Koh is world renowned for his precise and well written pieces on high-end watches in Revolution Magazine, a highly visual quarterly publication based in Singapore.